all the freedom of self catering but we cook your Christmas lunch for you! We have either Luxury Apartments sleeping up to 4 people or more traditional Villas perfect for getting away with a group of friends or family and our Christmas package is available for 2 or 3 nights and includes a breakfast pack on arrival which includes everything you need for a traditional Scottish cooked breakfast. 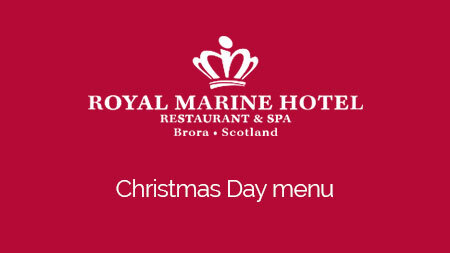 Join us for Christmas Day Lunch in the Royal Marine Hotel between 12pm and 2.30pm and enjoy the log fires and great festive spirit. The above rates are per apartment per stay and inclusive of Christmas Day Lunch. All linen and towels are included. There is a small charge of £12.50 per cot, £7.50 per highchair and £12.50 per extra bed. Please ensure these are booked in advance. Minimum stay of 2 nights. To book please call us on 01408 621252 or book online now >> and please note that a non-refundable deposit will be required on booking and full payment will be required by 1st December 2018.